Gala are part of the giant gaming group Gala Coral Group Limited that owns the high street bookmakers Coral (and their online site) as well as Gala bingo and casino halls in towns and cities across the UK. Galacasino.com is operated by their Gibraltar wing, hence the site is licensed and regulated by the Government of Gibraltar. Gala are huge players in the industry with an unblemished reputation and tons of experience and know-how when it comes to casinos, both online and of the bricks and mortar variety. 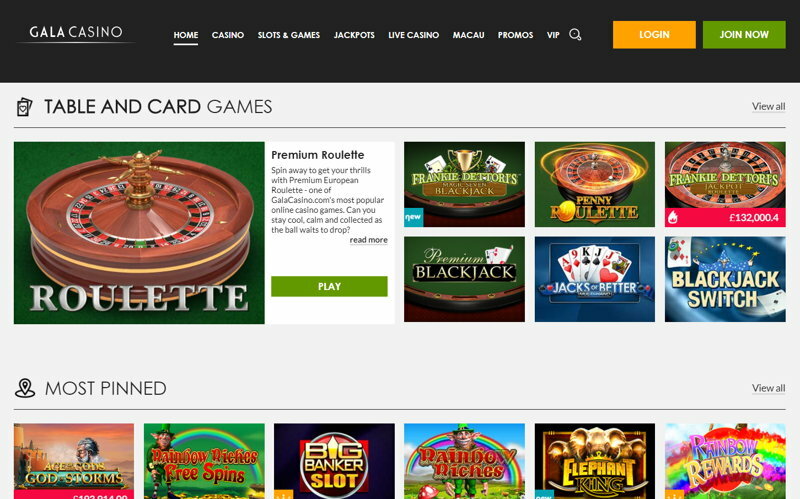 The casino is powered by the superb Playtech software which offers a superb casino experience whether you are playing the main online casino, live casino or dedicated slots suite. You can play a wide range of games instantly in your browser or choose to download their software – a very quick and easy process – for the full range. Gala have around 750,000 active members and with such a polished product it’s easy to see why. Gala are up there with the very best sites around and much of that is down to their size and experience. They offer everything you could want, with top notch games from the best provider about, huge bonuses with regular offers for existing players and excellent customer support via live chat, UK freephone (based in Guildford) or email. Whatever your favourite game is you will almost certainly find it here, with excellent graphics and sound and gameplay to match. The site itself is one of the easiest to navigate we have ever seen and finding your favourite among the 400+ games on offer is really easy. No weaknesses, top site, sign up, snaffle some bonuses and enjoy some great games! Is that simple enough?